Firearm Platform - AR-15, SCAR-16, SIG556xi, and other STANAG compliant 5.56mm rifles. These aluminum mil-spec magazines from D&H have a tan finish that complements FN SCARs and desert-colored AR-15s well. 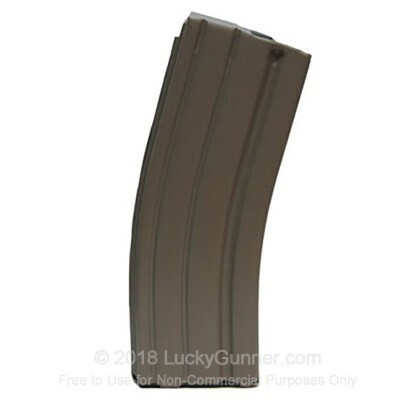 Each mag holds 30 rounds of 5.56 NATO/.223 Remington ammunition (as usual, beware of local or state regulations). Each magazine uses a mil-spec green follower, a 6061-T6 aluminum body , and 17-7PH stainless steel springs. D&H Industries has been a supplier for the AR-15/M-16 platform (and its military versions) almost since the rifle's inception. Formerly known as LaBelle and then Quest, D&H continues to service military and law enforcement contracts and supply gun owners as well. The company's headquarters and metal stamping operations are based in Wisconsin. Please click here for our current in stock specials on 5.56x45mm!